The first African-American World heavyweight champion, Jack Johnson dared to crash through the color barrier that saw to the creation of two classes of boxers since the inception of the sport. A master of ring science and a gaudy, bold character that by his very nature was given to pushing the envelope, Johnson enraged the defenders of white supremacy with his refusal to accept anything less than total equality. He was beloved by blacks, the down trodden and even some whites, but for the most part he was thoroughly hated and eventually conquered by those that saw him as a threat to the racial status quo of the time, that being America’s divided society. The son of a former slave, Johnson grew up poor in Galveston, Texas where at the time blacks were forbidden to use the same public washrooms and sidewalks as whites. Having very little in the way of formal schooling, Johnson found work toiling on docks at a very young age. During this period in his life, Johnson demonstrated a natural talent for fisticuffs. He honed his craft taking part in “battle royals”, racist spectacles in which several black fighters fought at once until essentially the last man standing was declared the victor. As per the accepted custom, white spectators would toss coins to the winner. Though crude and unquestionably dangerous, these free-for-all events were often the only venues available to black fighters, with only the most cunning and very best emerging with anything to show for the risk and effort. In November 1897, ‘The Galveston Giant’ turned professional with second-round knockout over Charley Brooks. In his third professional contest in May 1899, Johnson was stopped by John ‘Klondike’ Haines in the fifth of a 6-round contest. In his next bout held in March 1900, Johnson went a full fifteen rounds at the Galveston A.C. only to receive an official no contest verdict in a bout with Jim McCormick. It was reported that “McCormick finished the fight with a closed left eye and a swollen left cheek, while Johnson had spit a quantity of blood”. The reason for the official verdict was so as to avoid a clash with Texas State Law, which forbade prizefighting; the Galveston A.C. employed fighters as their physical instructors and labeled their fights as ‘exhibitions of boxing’ for the members of the club. West Coast champion Jim Choynski stopped Johnson in three-rounds in 1901, and then taught him ring tactics when both were jailed after police raided the event. 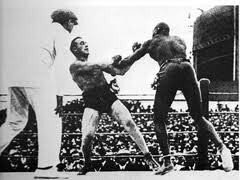 In 1903, Johnson won a 20-round decision over ‘Denver’ Ed Martin for the black heavyweight title, which he went on to defend successfully four times over the next two years. In 1905, he lost a decision to Marvin Hart, a gifted fighter that would eventually go on to win the World heavyweight championship. Two years after that, Johnson scored a sensational 2nd round knockout of former heavyweight champion Bob Fitzsimmons, causing waves for those that supported the racial barrier in boxing. Despite being an obvious contender for the World heavyweight title, Johnson was refused a shot because of his race. He finally received the opportunity years later on December 26th1908 when he faced reigning World heavyweight champion Tommy Burns in Australia after pursuing him all over the world, taunting him in the press at every opportunity for a match. The fight lasted fourteen rounds before being stopped by the police in front of over 20,000 spectators. 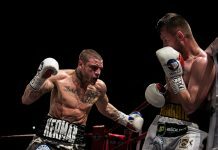 The title was awarded to Johnson on a referee’s verdict of technical knockout, after having administered a severe beating to the much smaller Burns. During the fight, ‘The Galveston Giant’ had openly mocked both Burns and his corner men. Every time Burns was on the cusp of collapse, Johnson would ease off on his attack, punishing him more. The camera was stopped just as Johnson was finishing off the battered soon-to-be former champion, so as not to show the world Burns’ defeat. By beating Tommy Burns, Jack Johnson had made history and in the same breath infuriated white society by becoming the first black World heavyweight champion. Johnson added insult to injury by openly flaunting his fame and wealth. Almost immediately, the search was on for a ‘Great White Hope’ to reclaim the greatest crown in all of professional sports. In 1909, reigning World middleweight champion Stanley Ketchel challenged Johnson in what was essentially an exhibition gone awry. After surprising and flooring the much larger Johnson in the 12th round, the heavyweight champion got up and suddenly switched into high gear, flattening the hard-hitting Ketchel with one vicious punch. After the match, Johnson claimed that he had agreed to carry Ketchel but had become enraged when the middleweight champion floored him. 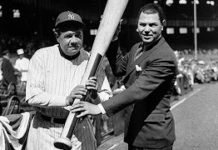 Finally, white hopes were pinned to former World heavyweight champion James J. Jeffries who was persuaded to come out of a six-year retirement to face Johnson in July 1910. 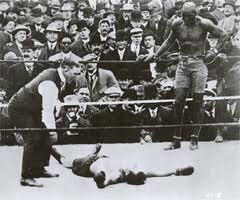 Rumored to have shed upwards of 100lbs for the bout, Jeffries was out-boxed, out-foxed and systematically disassembled. 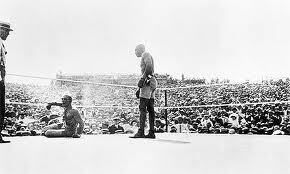 Movies cameras recorded the battle, which Johnson clearly dominated before matters were waved-off with a badly battered Jeffries totally beaten and defenseless by the 15th round. Blacks in cities across the country burst into an extended celebration. The film of Jeffries’ demolition by the black World heavyweight champion was not shown. Outside of the ring, Johnson’s taste for bi-racial romance sent his enemies into a prolonged tizzy. He reveled in being photographed and filmed with white woman, going so far as to flaunt his affairs for the sake of sticking it to white society. Eventually he was caught and convicted of transporting a minor across state lines for immoral purposes even though the teen-aged white woman was in fact Johnson’s legal wife. Later, to avoid time in prison, Johnson fled to Canada and then Europe where he twice defended his title in Paris. 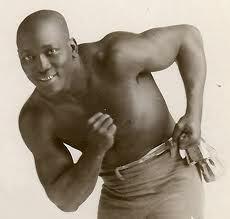 In 1915 Johnson was persuaded to defend against the huge 6’6” Jess Willard, 20-3-1, 18 KO’s in Havana, Cuba. Johnson found that he could not knock out the giant Willard, who fought as a counterpuncher, making Johnson do all the leading. At 37 years of age and in questionable condition, ‘The Galveston Giant’ began to tire in the 20thround of a match scheduled for a forty-five round distance. 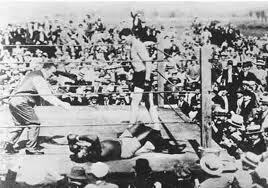 Visibly hurt by heavy body punches and feeling the effects of the bright sun and extreme heat, Johnson went down for the count after Willard caught him with a big left to the body and a heavy jab to the head. In the years since, legend has it that Johnson is said to have spread rumors that he took a dive, and that it was “in his best interest” to relinquish the championship given his legal situation. 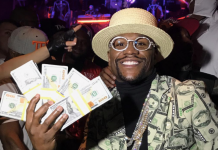 A promise by the bout’s promoter to get Johnson back into the United States failed to materialize, and the former heavyweight champion continued to live in exile. In 1920, Johnson surrendered to federal authorities and served eight months in Kansas’s Leavenworth Prison. After his release, Johnson fought sporadically until 1938 when he finally retired at 60 years of age after being knocked-out in the 7th round of a bout with a 1-1 non-descript foe. The colorful if controversial career of Jack Johnson screamed defiance and life in the fast lane at a point in time when compliance and moderation were the standard for most respected American citizens. By living according to his own rules and spirit, Jack Johnson managed to blast through the flawed racial barriers of the accepted norms of the time. For better or for worse, his name and reputation garnered headlines and the few who had the where with all to recognize his iconic status capitalized. The legendary Henry Ford was as shrewd a businessman as there was back in the day. He was keenly aware that ‘The Galveston Giant’ loved to drive cars fast and he knew the value of the publicity it brought to the Ford Motor Company when Johnson made headlines after being busted for speeding in one of his brand new high-end model automobiles. Ford went out of his way to personally ensure that the former World heavyweight champion received a brand new car every model year, ironic in that Jack Johnson met his demise in a high speed crash in one of those flashy new automobiles on June 10th 1946. Right to the very end at age 68 he lived his life in the fast lane and died much like he lived – on his own terms. Jack Johnson’s official ring record stands at 54-11-7, 35 KO’s. He is rightfully enshrined in the International Boxing Hall of Fame in Canastota, New York. Next articleJuan Manuel Lopez finally meets his match – Salido stops him in ten!